Bought this coat for my daughter-in-law. She loves it. Keeps her warm in the Minnesota winters. Michael Michael Kors Womens Black 3,4 Down Puffer Coat Hooded Chest pockets, Lining: Polyester; filling: 55 PORCENT down, 45 PORCENT feather, Zip front closure; zip out faux fur hood; detach belt, Machine Washable. Michael Michael Kors Womens Black 3,4 Down Puffer Coat Hooded Chest pockets, Lining: Polyester; filling: 55 PORCENT down, 45 PORCENT feather, Zip front closure; zip out faux fur hood; detach belt, Machine Washable. Michael Michael Kors Womens Black 3,4 Down Puffer Coat Hooded Chest pockets, Lining: Polyester; filling: 55 PORCENT down, 45 PORCENT feather, Zip front closure; zip out faux fur hood; detach belt, Machine Washable. 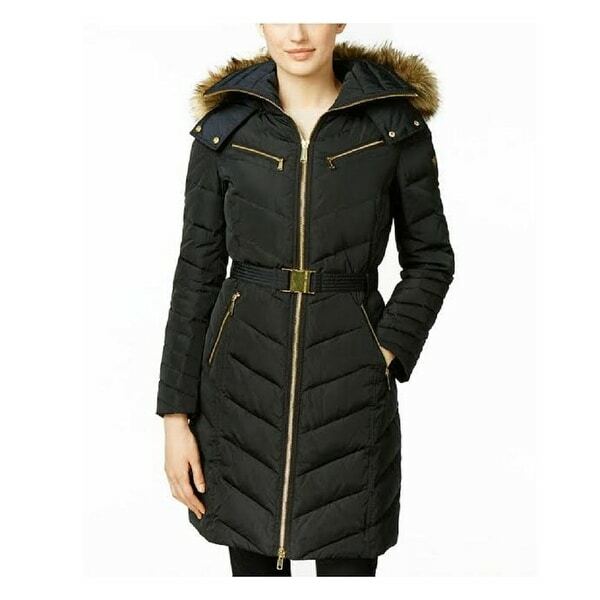 Michael Michael Kors Womens Black 3,4 Down Puffer Coat Hooded Chest pockets, Lining: Polyester; filling: 55 PORCENT down, 45 PORCENT feather, Zip front closure; zip out faux fur hood; detach belt, Machine Washable. Michael Michael Kors Womens Black 3,4 Down Puffer Coat Hooded Chest pockets, Lining: Polyester; filling: 55 PORCENT down, 45 PORCENT feather, Zip front closure; zip out faux fur hood; detach belt, Machine Washable. Dimensions 6.0 In. X 8.0 In. X 6.0 In. This cost is beautiful I think it will be very warm, with the down.